Transparency Market Research (TMR) observes, the global tunable diode laser analyzer market is highly fragmented due to presence of number of companies operating in the market. Some of the key players operating in the global tunable diode laser analyzer market are Neo monitors, Honeywell International Inc., Emerson Electric Co., Servomex, and ABB Ltd. Increasing number of mergers, collaborations, and acquisitions is predicted to accelerate growth and consolidation of the market in the next few years. A report estimates, the global tunable diode laser analyzer market is expected to attain value of US$548.8 mn by the end of 2021 with a CAGR of 10.20% over the forecast period of 2015 to 2021 from valuation of US$280 mn in 2014. Based on the type, in 2014, in situ type measurement accounted for largest share in the revenue of about 67.4% in the global market. Based on application, oil and gas segment is expected to dominate the market with 25% of shares in the same year and is expected to remain dominant over the forecast period. Based on region, in the same year, Asia Pacific dominated the global market by accounting for 37.0% shares in the global market. The global tunable diode laser analyzer market is expected to witness growth with healthy rate from last few years. Growing investments in the research and development (R&D) activities coupled with growing focus on the advanced features of tunable diode laser analyzers and focus on improvement of products are fuelling growth of the global market. Growing adoption of modern services are expected to support growth of the market. Additionally, among the other measuring instruments, tunable diode laser analyzer is a new technique. It has ability of detecting and measuring gases available in environment such as HF, HCL, NH3, oxygen, and carbon dioxide even in very low air density. Besides, rising demand for advanced equipment to measure amount of toxic gases present in the atmosphere coupled with increasing demand for safety devices and growing demand for tunable diode laser analyzer due to growing industrialization globally is boosting growth of the tunable diode laser analyzer market. Additionally, government and numerous private organizations ensuring safety of environment have mandatories the installation of gas detectors in industries and manufacturing plants. 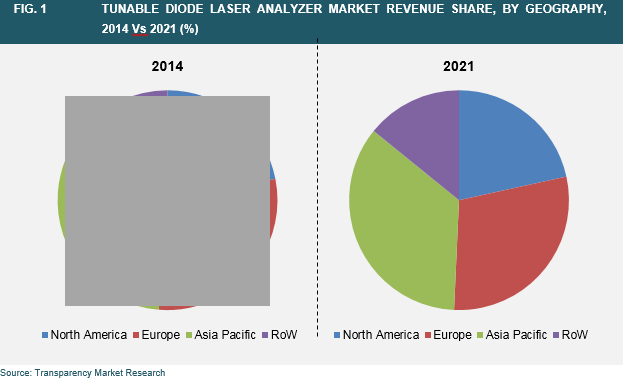 In addition, ability of seamless detection, low maintenance cost, and improved stability of equipment are boosting growth of the tunable diode laser analyzer market. Despite this, the availability of alternative technologies is restraining growth of the global tunable laser analyzer market. Nonetheless, the price of tunable diode laser analyzer is likely to reduce over the upcoming years which is expected to offer growth opportunities for key players in the coming few years.